I love my job. I really do. The industry I work in is tailor-made for me. But it's not always glamorous. I posted HERE about a super awesome client from awhile back who told me how much of a rock star I am. Those clients who notice all that I do are few and far between. The company I work for isn't always quick to recognize me either. Probably because my role is misunderstood and erroneously gets lumped into the sales department, which means that everyone else thinks we giggle all day, do no real work, and go out to drink on the boss's dime at 4pm. I'm not in this job for the recognition, but I won't kick it out of bed if it jumps in. Then our quarterly all-employee meeting happened. And the GM spouted off a bunch of things about how awesome this award recipient was and how much they do for the company and how important their job is. Then he said that the company is very lucky to have this person as an employee. (Which was not said about the other winners, I may add.) And he called my name. 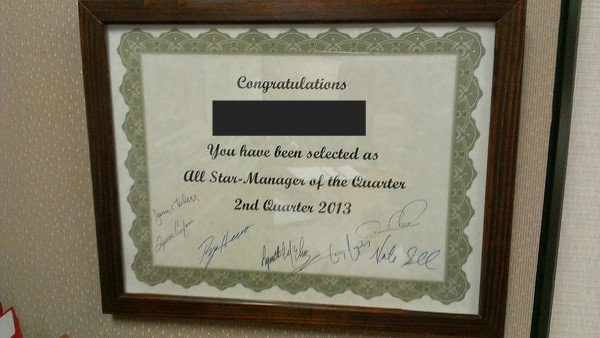 All star manager for the quarter. It's practically unheard of for anyone in my realm of the company to win this award. As I said, most people don't understand what I do. And this is a nominated award. My coworkers had to take their time to fill out a form and submit it. So humbling! I will graciously accept the certificate, but I will be even happier to accept the month of free parking (a $70 value), the $50 Visa gift card, AND an additional paid vacation day!